The next level of mobile photography? Dual-lens cameras on the back of smartphones? Pretty much par for the course now. Triple-lens cameras? Yeah we've seen those too. But 16 lenses packed inside one rear-facing camera? Now we're really talking, LG. Newly filed patents spotted by LetsGoDigital suggest LG is at least thinking about cramming 16 lenses into a camera in the future, which we guess would make it a hexa-camera. Apparently, with a curved setup, these 16 lenses could capture a photo from several different perspectives, and even simulate movement from a still image. It would also make it easier to replace objects in photos, as per the patent documents, because the phone would be able to capture more information about them in three dimensions rather than just two. Some pretty cool effects might be possible. The patent goes on to detail how a mirror and a flash could be placed separately on the back of a phone carrying a hexa-lens camera – to illuminate subjects and to make it easier to take selfies using the rear-facing camera rather than the front-facing one. As always with patent filings like this, it's not a guarantee that we'll ever see an LG smartphone sporting 16 lenses on its rear-facing camera – a lot of patented ideas never make it to actual products. But it is a sign that LG has something like this on the drawing board that it would like to develop further. In the meantime, we're stuck with cameras with two, three or maybe five lenses. 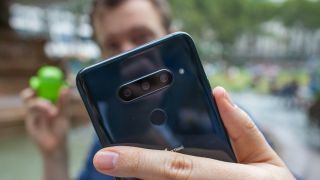 It looks as though cameras – and camera lenses – could soon become an even more important consideration when it comes to choosing a new smartphone in the future.